The New York Knicks played spoilers to LeBron James’ homecoming to the Cleveland Cavaliers Thursday night, pulling off a 95-90 victory. James struggled throughout the night, scoring 17 points on 5-15 shooting with 8 turnovers, and much of the Cavs looked disoriented and unfamiliar with each other. 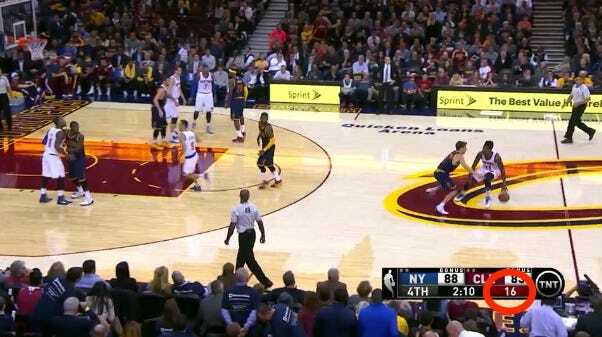 Meanwhile, the Knicks used a balanced team effort and some surprisingly stout defence to put the clamps on the Cavs. Up five points with 2:18 to play, the Knicks were pressured by the Cavs defence, took forever to get into their offensive set, and ended up with a crucial shot clock violation. As you can see, the Knicks didn’t even get the ball over until there were 16 seconds left in the clock, almost risking an 8-second violation to get the ball across halfcourt. Even still, the Knicks weren’t in their offence. 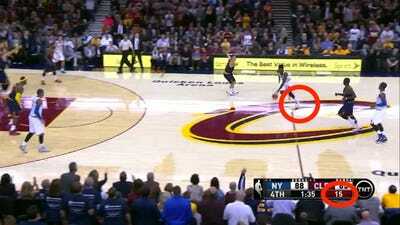 J.R. Smith and Anthony then made up for the previous plays in the final minute. On the next Knicks possession, Smith drove the lane for a floater to put the Knicks back up by five. After a layup by James on the other end, Carmelo Anthony stuck a jumper in James’ face to put the Knicks up five, effectively sealing the win.